Start by dicing up bacon and putting it in a medium pan over medium heat to cook. Cook for 6-8 minutes stirring occasionally, until the bacon is brown and starting to get crispy. Remove to a paper towel-lined plate to cool. While bacon is cooking, cut up onions and tomatoes and place in a bowl. Add shredded chicken to the bowl. We used leftover crockpot chicken. For the crockpot chicken, you just put about a pound of chicken breasts or thighs in your crockpot with about a cup of bone broth or a jar of salsa and let it cook for 6 hours on low or 3 hours on high. After the chicken is done, take it on out and shred away. You could use a rotisserie chicken or other leftover chicken you have on hand as well. Add in bacon, mayo, and dill to the bowl and mix well. Prepare lettuce by removing leaves to use for "shells". 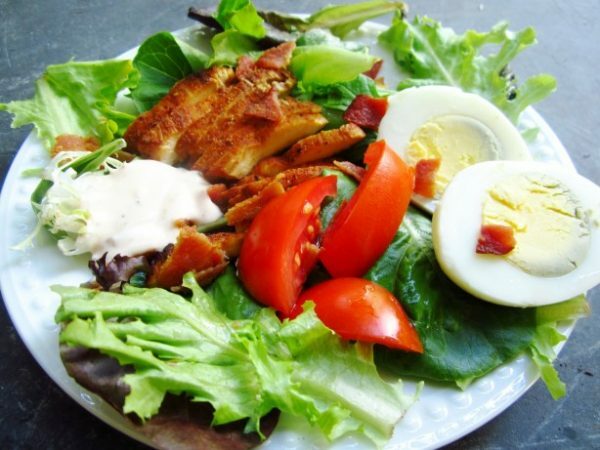 Fill leaves with BLT chicken salad mixture and enjoy!